York Beach Cottage Sleeps 8 Plus! This lovely traditional beach cottage sleeps 8 comfortably with room for additional guests. Upon arrival, you'll find the beds made with clean linens. Simply unpack your bags, grab the beach gear and head to the beach! A short walk to the bath house at Long Sands (about 7 minute walk), you'll find all you need for a fun week at the beach. Large deck with gas grill, a fire pit and horse shoe pit in the back yard, games, outdoor shower, beach chairs, boogie boards, bicycles and more! Upstairs sleeps 8 people with two private bedrooms plus two loft areas. Downstairs, there is a pullout queen sofa in the living room and a futon on the porch. Our cottage is east of Ridge Road on a dead end street. It's about 900 walking steps to the bathhouse at Long Sands Beach. A large beach cart is provided, along with beach chairs and coolers. When you come back from your day at the beach, rinse off in the outdoor shower with hot/cold water then relax on the back deck. The kitchen is basic yet recently renovated and fully stocked with all you'll need to cook and serve for 8+ guests, including a new blender, bake ware and a large lobster pot. The back yard is the perfect place to spend your evenings. Sit around the fire pit, roasting marshmallows and enjoying the cool ocean breezes. If you get rainy weather during your trip, you'll find plenty of activities in the 3 season porch to keep the kids busy, along with two TV's, a dvd player and Wi-Fi/cable. Linens and towels for 8 guests are provided. 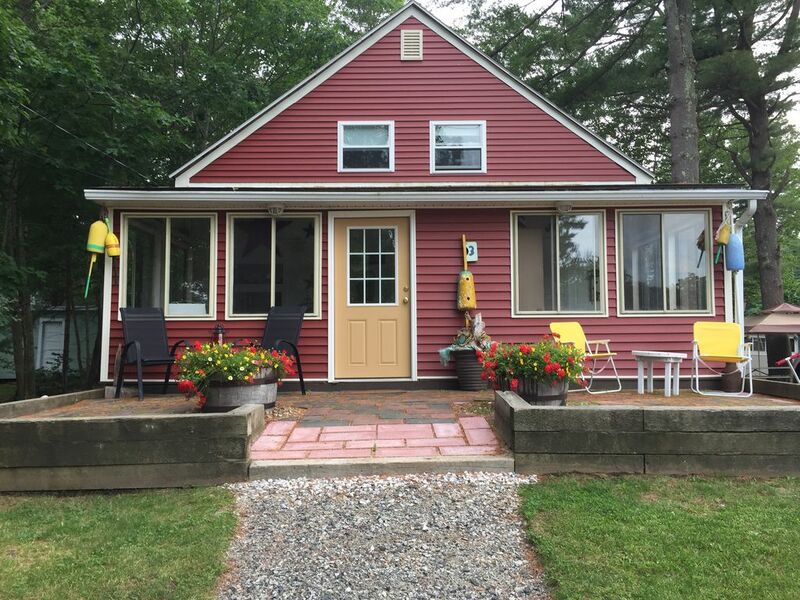 Our cottage is the perfect place for larger families to relax and enjoy what York Beach has to offer. 3 night minimum stay during off season and 7 night minimum stay June 16 - August 17. I live in Massachusetts and travel to Maine weekly to sell antiques at shops along route 1. My family has enjoyed many summers at our cottage. When I saw this cottage for sale ten years ago, I knew it would be the perfect spot for my family. I enjoy having extended family share our vacation time so large rooms with plenty of sleeping options allowed me to invite the whole family to York. This property has been renovated over the years yet it still retains a cozy cottage feel. It is the perfect place for large families to make memories. About 6 minute walk to the bath house at Long Sands Beach. 1 window air conditioner and several fans. No central heating. Space heaters provided. Linens will be provided in 2019. 2 bikes available for guests. boogie boards, skim boards, beach chairs, beach toys, etc. Everything you need for a great vacation! We had everything we needed to have a great vacation. Some of the time it rained but we had plenty of activities to keep us busy. The fire pit was great.I would highly recommend it to anyone looking for a great time . We had a great time The cottage was clean and tidy ! Sharon met us there and was great she showed the grandkids all the games and toys they had for guests. It was a quick walk to the beach loved the outside shower to wash off the sand. . Plenty of space and beds Kitchen was fully equipped made cooking and grilling easy. The yard is nice and plenty of deck space for eating outside. If your looking for a clean well maintained spacious place to make summer memories this is a wonderful place to stay. It was very comfortable and accommodating. It was clean and we loved the location. We spent a week in July at this spacious, clean, welcoming home. My husband, and I and our four adult children along with a friend and her two daughters had such a great time at this cottage. We felt very welcome and there was plenty of room for everyone to sleep. I would definitely love to rent this house again next time we visit Maine. Fire pit was a big hit!! We enjoyed our stay here. Close to the beach, cozy, and very clean. also enjoyed bikes, games and beach supplies that was there for guest use.